Saturday February 24th 1883 It was a fearful day with sleet and snow the going was terrible. I got the work done in the forenoon and soon after dinner went over to Hatts to spend the afternoon. It was supper time when I got home. I helped do up the work in the evening and knit a little. I had a letter from Will Reed. Sunday February 25th 1883 I was busy about the work all the forenoon and read a little in the afternoon. Mother was nearly sick with a sore thumb I got the supper alone John & Hatt were over in the evening. Uncle Jacob went home today. 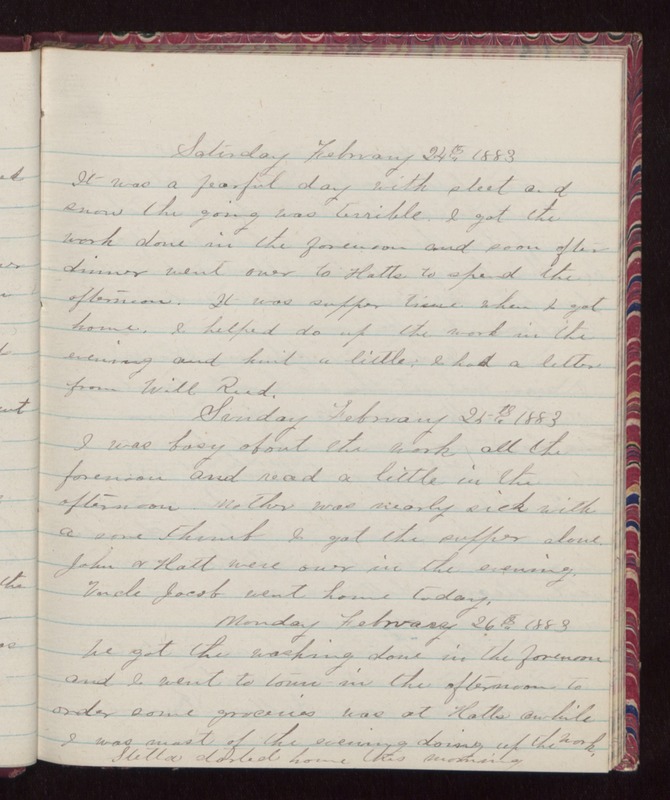 Monday February 26th 1883 We got the washing done in the forenoon and I went town in the afternoon to order some groceries was at Hatts awhile I was most of the evening doing up the work. Stella started home this morning.